Over the past 30 years, I’ve had ample opportunity to see how married couples handle their finances. Some do a better job than others, but in general it is healthier for those finances — and the marriage itself — if both spouses take the attitude that they are in this thing together. That may seem obvious, but what often drives a wedge between husband and wife when it comes to finances is that one of them assumes full control of that aspect of the household so it is more of a solo act than a team effort. This may be because one spouse earns more than the other, is more comfortable with financial matters, or is simply more bossy. The problem is, both spouses have their lives invested in the results, and both can do a great deal to influence those results. That’s not to say that specific tasks can’t be divvied up. There should be clear responsibilities as to who pays the bills, who balances the checkbook, etc. Often things get done most efficiently in a marriage by a division of labor according to each person’s talents and inclinations. Division of labor has worked well in my marriage — there are a couple of things I’m good at, and my wife is good at everything else, so it all works out. However, while specific financial tasks may be assigned to one person or another, it is important that there be enough communication on how things are going, and collaboration on key decisions, for both husband and wife to feel fully engaged in and responsible for the process. Neither spouse should be blamed for economic setbacks. The unemployment rate has been above 7 percent since the end of 2008. As a result, an unusual number of people have been without work for a long time, and that does not include those who have been forced to work part time or in lower-paying jobs because of a scarcity of better opportunities. The point is, while couples are responsible for their willingness to work and how they spend money, some things are beyond control. It is important to recognize that some problems are not caused by anyone in the relationship — they are just the way things are. The blame game is unproductive, and bad for a marriage. Many couples these days are disappointed with their financial situations, but it doesn’t help matters if one spouse blames the other for everything. This is more likely to happen if one spouse has taken a disproportionate amount of responsibility for bringing in money and running the household on a budget. Sharing responsibility means less finger-pointing. The marriage should not be separated into earner and spender. It is too easy for a couple to fall into roles where one person brings in most of the money, and the other spends most of it in the course of running the day-to-day household. This creates natural tensions — one feels the other spends too much, and the other thinks the first one doesn’t bring in enough. Both career and spending decisions should be shared. Both spouses should feel empowered to improve the family’s financial condition. Most people are too busy to spend much time actively looking for new opportunities to make or save money, but they do come up in the course of day-to-day life. If both spouses feel empowered to spot opportunities to refinance, to save money on a major purchase, to earn a higher saving account rate, or to get a higher-paying job, it increases the family’s chance of benefiting from these opportunities. There should be no surprises when it comes to finances. When one person shoulders a disproportionate share of the financial responsibility, they have a tendency to shelter the other person from setbacks until it is too late to avoid acknowledging them — at which point these setbacks come as more of a shock, which leads to recriminations. More openness means that at least both spouses will see trouble coming. Both spouses should be ready and able to take the lead in managing finances if necessary. 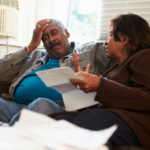 One of the tragic things that happens after the death of a spouse who has taken on all the financial responsibility is that the other spouse feels completely lost and overwhelmed. This leaves a person vulnerable to mistakes or to financial scams. If you feel responsible for your family’s finances, part of that responsibility should be to make sure your spouse is ready to take over if anything happens to you. Lot of good points here. In my opinion, the more communication the better. One partner should never hide anything else regarding the money situation. So many people let money come between them. I don’t think that money should be a taboo topic, but many people don’t feel that way so it may have to be something that my partner gets to learn about me! My second wife and I keep our finances almost completely separate. Other than paying for most of the food because she is living free of charge in my house, she pays for her own cars, medical, pets, clothes, etc. I pay for our travel together, eating out, entertainment and such. I do almost all the cooking and grocery shopping; she cleans and helps with the gardening. Her income is from two rental houses and SS. Marriage is a partnership and it should be the same when it comes to money. Both spouses need to be responsible about money, to openly discuss matters and try to solve the problems, not pass the blame.